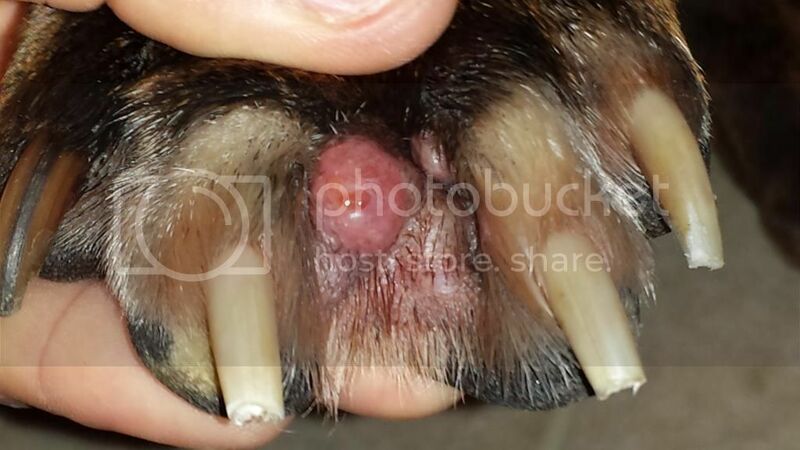 Our 3 1/2 year old Male Brindle has gotten these sores or blisters, I don't believe they have any puss in them from the times that I have actually touched them. He has always had a pretty uphill battle with skin allergies since he was born, but nothing ever like these. I don't know no as I am second guessing my memory if they started out as just one and then they spread, or if they were always spread about and I didn't notice as the one that caught my attention was pretty noticeable compared to the others that are significantly less noticeable. A note to add would be that just over a month ago, my wife, kids and I flew out of Minnesota to spend two weeks in Seattle. In the time that we were gone we boarded our dogs at a facility that I checked out in depth as that was the first time our dogs have been away from home and family. All his vaccines, shots, precautions i.e. kennel cough vaccine and such were all up to date. 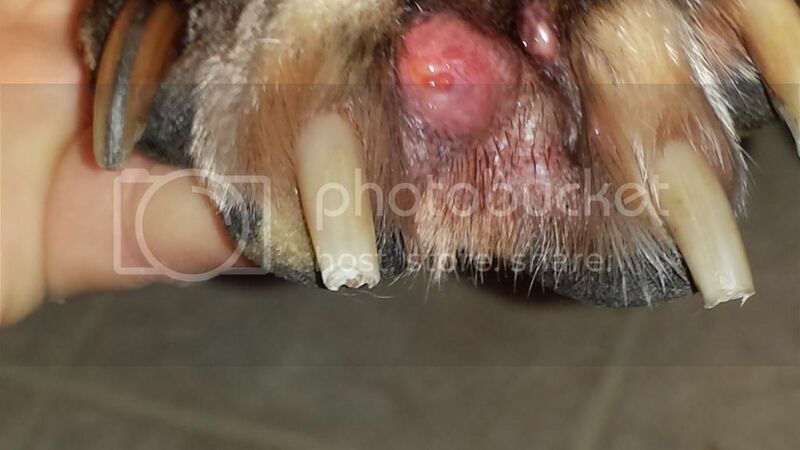 He didn't have these sores/blisters before he went to the boarding facility. It wasn't until a few days after I picked them up that we noticed them. I thought maybe he stepped in some chemical that didn't sit well with his skin, or he was bitten by some sort of bug not common to him like everyday flies and mosquitoes around home or something...the kicker to that train of thought and makes me confused even more is...our 3 1/2 year old female brindle was boarded there with him for those two weeks, and on top of that they shared a deluxe sized kennel the whole time and she has no sign of anything even close to these anywhere on her. 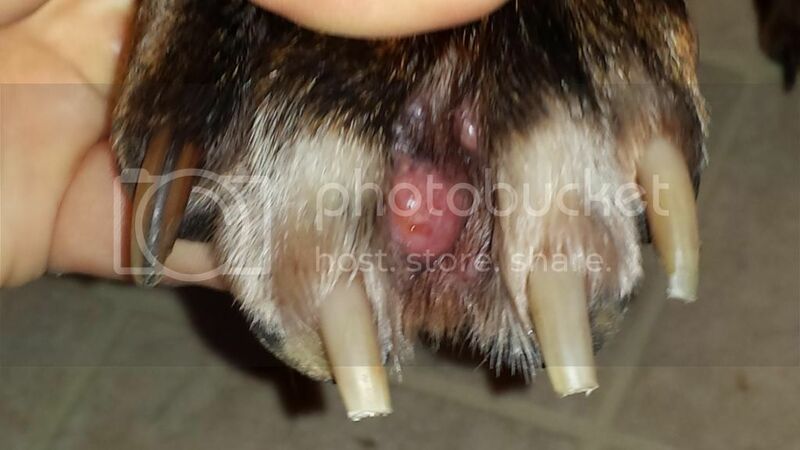 He doesn't seem to be in pain at all, our vet recommended upping his dose of benadryle and bathing often and seeing if they clear up as it is a huge ordeal and takes planning ahead of time for a trip to the vet. In the meantime my head won't rest and I was wondering if anyone could add some insight to this problem? Thank you very much for that! I guess it never crossed my mind to even look on you tube, cause all i ever do on you tube is watch this http://youtu.be/B7UmUX68KtE?list=PLkDJa ... 6wKeoXpvV7" onclick="window.open(this.href);return false; with my 11 month old son! He can't get enough of it, so if ya need a laugh off the subject, IT'S GREAT! Thank you for the reply I appreciate it!